Witch Doctor Jangalar: You have done a wonderful thing, . With da destruction of Gloomtail, Maka’fon be no longer bothered by da presence of da razorwings. It seems dat Gloomtail destroyed her eggs some time ago. 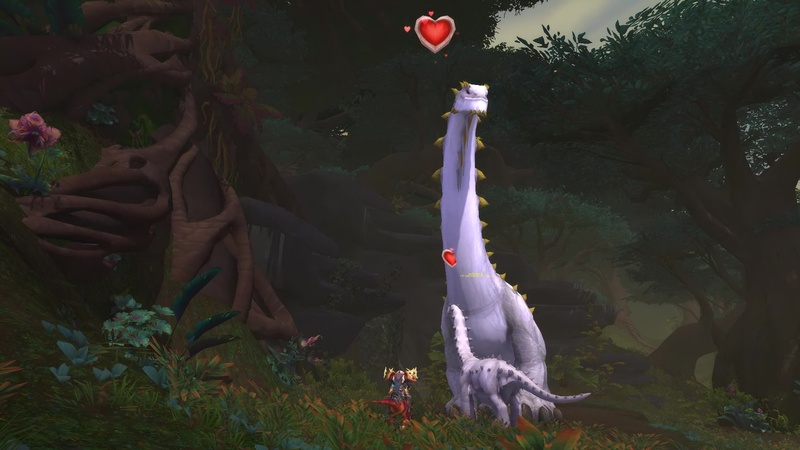 Take Gloomtail’s head to Maka’fon as proof dat he is gone and, when she finds da scent of Ben’jin on it, she will once again be seeking a worthy mate. When Ben’jin senses dat, he will approach and nature will take over. Place Gloomtail’s head in front of Maka’fon so that she knows her territory is safe and that Ben’jin is the reason. Witch Doctor Jangalar: Cala, let us go and see da culmination of what we have wrought. Cala Cruzpot: I enjoy a good love story. Let’s go! Witch Doctor Jangalar: Place da offering before Maka’fon, (Name). I believe her desire for revenge will be sated. Witch Doctor Jangalar: She has accepted the offering. Look, Ben’jin approaches. Witch Doctor Jangalar: Nature will find a way. We should leave dem in peace now. I think our work is done. Witch Doctor Jangalar: Dis is a wonderful moment and I feel hopeful dat dis species of brutosaur will survive and thrive here in da jungle. Witch Doctor Jangalar: I sense dat both dinosaurs will be happy. Dere is a chance for da species now. Cala Cruzpot: They’re a cute couple! We should rent access to other scientists. We’ll make a killing! Witch Doctor Jangalar: Dat seems less than… moral, Cala. Cala Cruzpot: And their kids, too! I can rig up a photobooth and dino plushies. You’d get a cut, of course, Jangalar. 70-30 or something. In my favor as the idea woman. Witch Doctor Jangalar: (Name), you’d best be going. Cala has a lot of ideas to be shot down.